Jared Dixon – Courtesy of Broadway in Indianapolis. Used with permission. Old National Centre in downtown Indianapolis is the venue hosting the return engagement of “The Lion King,” presented by Disney Theatrical Productions and Broadway in Indianapolis, September 12-29. The winner of multiple 1998 Tony Awards, “The Lion King,” which is based on the 1994 animated feature film, premiered on Broadway in 1997. Since then, there have been 25 global productions seen by over 95 million people. With a musical score by Elton John and Tim Rice, the show’s director, costume designer and mask co-designer Julie Taymor continues to supervise productions of the show around the world, including this North America tour. Jared Dixon plays the coveted role of Simba, the Lion King. 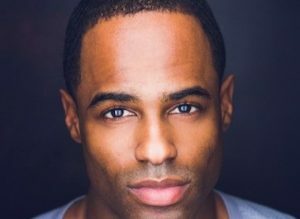 He was in the national touring company of “The Color Purple,” in which he played Grady (u/s Harpo), prior to joining this “Lion King” tour in June. Last week, I spoke by phone with Dixon while he was in Charlotte, one of the show’s stops prior to its three-week engagement in Indy. Below is an edited transcript of my interview with the 29-year old actor-singer-dancer. The abbreviated story is I am from Queens, New York. I kind of grew up doing everything, mostly playing sports as a kid, but I have been singing my entire life. I played basketball and ran track and when I started looking for high schools, I auditioned for LaGuardia Performing Arts, the “Fame” school, which also happens to be my father’s alma mater. We are both singers. He went there for vocals, as did I. I graduated high school and went to college, where I decided that performing was what I wanted to do. I auditioned for my first gig, which was also my first show, “Ragtime,” in high school. It was also my dad’s first Broadway credit. He was in the original company of “Ragtime,” so it was kind of a full circle thing there. Since then I have gone on to do singing, acting dancing, songwriting, and recording. The show premiered in 1997. They opened the first national tour 16 years ago. That was the Gazelle Tour. The second national was the Cheetah Tour, which I think just celebrated 15 years. Recently, the first national and second national tour closed and the Gazelle Tour became the Rafiki Tour, which is the same show, but changed so it can fit into different venues. So, the show is more versatile in terms of what it can do technically for different venues. There are some very small changes, but the story is the same. Some of the jokes are updated. To most eyes, there is no difference. I have seen the show at least four times. I noticed the differences between Broadway and tour, but I don’t notice any changes in the show other than some of the jokes. What accounts for the show’s longevity? “Lion King” is the most enveloping story. It really captures everything for everyone. It’s a feel- good show, but not a feel-good show in the sense that everything is perfect throughout the entire show. Like the movie, Disney really figured out how to pull our heartstrings with this show. It’s a story we can all get behind and believe in. It cuts across all racial, gender, age lines, does it not? It does. There is something for every race. There is something for every gender, every class, every color and creed. It really is a story of humanity and hope. Obviously, it is of great import to the African-American community, isn’t it? Absolutely. Having just seen the phenomenon of “Black Panther,” that whole Wakanda experience is kind of reminiscent of what “Lion King has been doing. Did you see a spike in interest in “Lion King” after “Black Panther” came out? Absolutely, yes. If anything, “Lion King” has had influence on “Black Panther.” It’s the idea that authenticity speaks the most whenever you are telling a story that is grounded in a culture. “Lion King” is really one of the most authentic of any work I have ever seen, just the amount of attention to detail, even just the bodies on the stage. It’s kind of the same idea. When you go to see “Black Panther,” if the story is going to be based in a state of Africa that has never been colonized, then it is going to reflect that idea. When you go to see “Black Panther,” you see all these shades of black and brown people and you also hear the different dialects, the different uses of tone, and language and colors. All of that stuff is what we are using in “Lion King,” so it is kind of interesting to see the conversation being restarted with new eyes because we are a different planet, a different country than we were all those years ago when “Lion King” came out. If “Lion King” was innovation, then “Black Panther” was re-innovation. Everybody is back into that conversation about cultural differences. Is there a production in Africa? Yes, there is a South African production. We have cast members who are from South Africa. In every production in the world, there are a number of South Africans, by design. It’s embedded in the DNA of the show and something they have held to for the past 22 years. We only have a portion of that and people can feel the power that comes from that group of our cast. Tell me what the role of Simba means to you? There are so many layers. In my mind, it is the most heralded role for an African-American male in musical theatre. It is the only show I can think of that is as successful as it is. This is the only role that was designed for a brown man. The name of the show is the “Lion King.” And Simba becomes the Lion King. Just the idea alone is extremely important for me when I go out onstage. I think about the story I am telling, not just for myself, but for the little black and brown boys and the black and brown girls who are in the audience and for children of other cultures who can see a story that they can relate to. To be able to relate to people of different colors and different cultures who have similar struggles. We all go through turmoil. We all go through pain, but there is always hope for all of us. I think that is one of the most important lessons that I get from every night and every time I climb up that rock at the end of the show. I look out into the audience and it is the most beautiful representation of America because there are all ages and colors. Do you talk to kids at the stage door and what do they say to you? Yes, every night and it takes a while to get out of make-up and costumes, but I try to get out there as soon as possible. I really do enjoy it. That is one of my favorite experiences. Doing the show and having the opportunity to be a real person to people. I know there is that whole idea of preserving the magic and you want the kids to remember that, but I think it is important to speak to them so that they can have a little bit of both. What do the kids usually ask you? The kids ask me what is my favorite part of the show and what my favorite song is. One of the cutest questions I ever got asked was…I usually don’t cry at the end of the night, but sometimes during the apparition of Mufasa returning and we have this giant Mufasa in the clouds right before the reprise. That just gets me sometimes…and one of the kids, after the show, asked me why I was crying and I said, “Because my father came down to give me a message,” and the little boy said “That’s beautiful.” I think he was about six. Do you enjoy singing the show’s score? With the African dialects and with this beautiful score to match the movie and also expand the musical ideas in the movie, it has its own style and feel. It has come to be known as a part of the Broadway style, but it is also the Disney sound and I really enjoy it. This music, I think, is grounded deep down in the Earth’s soil. Some of these singers open their mouths and you feel it shaking the entire building. And to be a part of that is just really special. I enjoy singing “He Lives in You (Reprise)” the most. It’s the only song I get to sing with the full ensemble on stage. Once I get to that moment, I am taking part in the ethos of the show. What do you want to tell Indy folks about this show even if they have seen it before? If you’ve seen it before, expect to relive the moment. Expect nostalgia. Expect to cry. Expect to feel all the things you felt, times two. If it is your first time seeing it, expect to be wowed and expect to witness the power of theater and magic of theater. Tickets for “The Lion King” are available at Old National Centre Ticket office or Clowes Memorial Hall or by phone at 1-800-982-2787.